Hip pinching & causing pain while doing a twist in yoga? There are other possibilities for hip pinching. Please also read Is Yoga Tearing Labrums? Hip pinching can show up in parvrita parsvakonasana, ardha matsyendrasana, marichyasana C, or other twists. The sensation is anything from mild discomfort to an ice pick sensation in the front and inside of the pelvis. The most common description however is that it seems as though something is getting “pinched.” Others describe it as a “stabbing” pain. This is a situation that I’ve come across a number of times in my travels. It’s not limited to beginners or any particular level of yoga student. The most extreme case I came across was earlier this year in Warsaw, Poland. More recently there were students in Tampa, Gainesville, and Savannah. Is it an epidemic of the “pinching” thing!? The situation that I come across is this. A student is on their way into a revolved side angle or perhaps a deeply bound twist. Revolved side angle happens to be the most common yoga posture where someone will actually voice his or her complaint. As the student is going into the posture they feel anything from a mild pinching feeling to a sharp spot of pain as they fold and twist into the posture. What is it? That’s the first question. How do you solve it? That’s the second and more important question. The way it has worked out for me is that the solution is what told me what the problem is. My best guess at the problem is that it is some sort of cramp of the iliopsoas. I say, some sort of cramp because I’m not sure that what’s going on fits the classical definition of what a cramp is. Either way, my experience tells me that this muscle, particularly the iliacus portion is in some state of spasm or cramp in this situation. I have dealt with this situation so many times now that I feel comfortable telling people what the problem seems to be and how to help. Regardless of the posture it happens to show up in, I do the same thing. In simple terms I get my fingers inside their pelvic bowl staying close to the bone and gently and slowly press and rub the iliacus muscle. Rarely if ever do I try to get on the psoas itself. See the video at the bottom for how to treat your own hip “pinch”. In 99% of cases, this reduces or eliminates the pinching feeling if the student tries to do the twist again immediately. That part is amazing enough that something so simple can create a change in such a short amount of time. It’s the bigger question that has no simple specific answer. The question is, why does the iliacus and possibly the psoas major finding itself in this “cramp” when doing postures such as this. 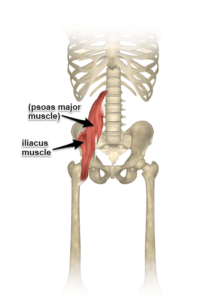 Iliacus and psoas major are both flexors and external rotators of the hip joint. Some books describe its ability to adduct the femur as well. I think it’s this combination that shortens the muscle so much that we end up with our “pinching” feeling. Although not always easy to see, when we do a twist the femur is often externally rotated, flexed and adducted! Making these muscles as short as possible. When muscles get into this shortened position, and engaged, they just have a tendency to cramp up. 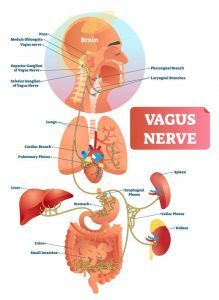 Here is a list of potential and possible contributing factors to these muscles being short enough that in our twists they go into a cramp and create that “pinching” feeling. Whenever I present the psoas in workshops these days I always suggest to people that they should not try to directly strengthen their psoas. 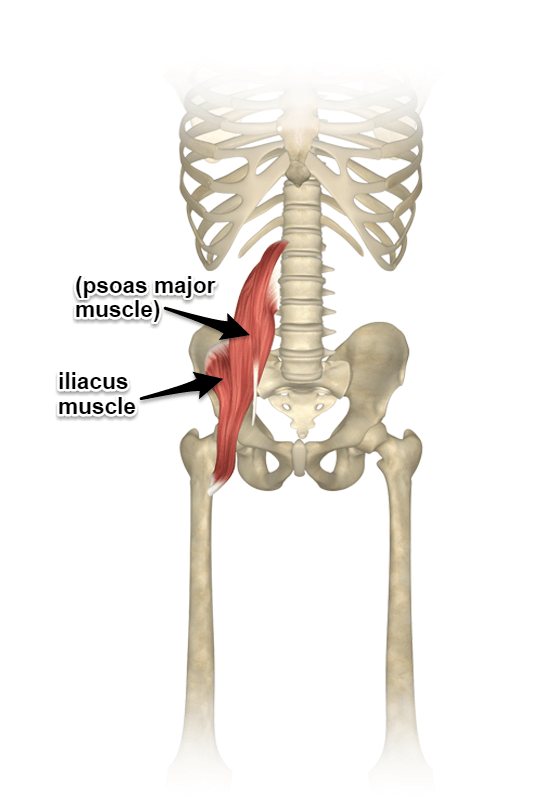 This isn’t to say that nobody needs to strengthen his or her psoas. 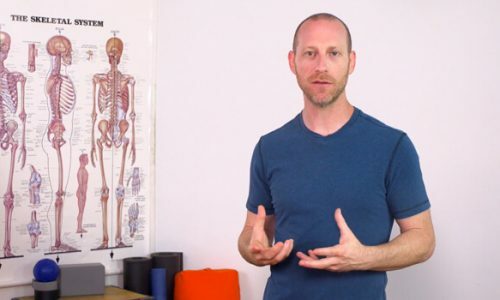 What it means is that we need to assess the state of our psoas before deciding whether it needs to be strengthened or stretched or have nothing done to it. Without the right information, throwing some strengthening exercises onto your psoas can lead to a number of problems, including back pain. Instead what I tell people is to establish a relationship with your psoas. Try to understand where it is, if it’s tight, weak, strong and then go from there. By relationship I mean, be clear on where it is, what its function is and also try and move from it and access it while in yoga postures. Lengthening is almost always an option. This is especially true for the iliopsoas and can be accomplished with simple postures such as lunges and supta virasana. Putting length into muscles can make them stronger as short tight muscles tend to be weak and generally unhappy. My dear friend in Warsaw had the worst case of this “pinching” feeling I had ever seen. As he described it to me, he was sure that there was a boney deformation at his hip joint. He believed that this stemmed from a childhood problem at that hip joint. His mind seemed convinced of it and as a result of this boney deformation he was unable to bring his thigh to his chest or adduct it. He could hardly flex his hip more than ninety degrees with his knee bent. All of us with our knee bent should be able to bring the top of our thigh to our chest; but not my friend. In addition, he could not adduct his femur toward his midline. When he tried either of these he felt what he described as a bone hitting another bone and a knife or ice pick on the inside of his pelvis. When someone uses either of these two words to describe pain, it means it’s a sharp specific point of pain. My mind was unsure of exactly what this could be. Could he be right? Was there a boney formation there? It was certainly a possibility. Could it just be his bone shape? I really didn’t know and I love this moment of being unsure of what I am going to do and what is going to happen. I love when new challenges arise to force me outside of my comfort zone, I almost always learn something from it. I’ve been alive long enough to know that I have convinced myself of things that are definitely NOT true. Over the last 15 years I’ve heard countless people tell me what their problems are, only to find out with good assessment and treatment that no such thing is true. Of course, as soon as they realize that it’s not true the problem changes very quickly. I approached my friend with an open mind. I honestly had no idea what was going on, but it did occur to me that he had an exaggerated case of the “hip pinch.” I approached with cautious hope that I would be able to help him in just a few days while in Warsaw. The first time I tried to touch his iliacus he screamed. Scared me half to death and I had hardly put much pressure on it. We worked with his breath and I backed way off of what was already not very much pressure at all. This did however tell me what the state of his iliacus was. NOT HAPPY! It seemed like I might be on the right track. Over the five days I spent with him while he was practicing in a group, we did various postures and I would go over and get my fingers into his iliacus and give it a rub. I would increase my pressure and move the hip around as I was doing it. I would also have him do lunges and supta virasana lifting his hips to stretch his hip flexors in general. Thankfully after just a few days his tissues were letting go. He was bringing his knee to his chest for the first time in almost 15 years. Adduction was significantly better as well and I’m hoping the changes remain until I return next year. That’s the worst case I’ve seen in a number of years. I don’t think you would have to do nearly as much as I did repeatedly for any of your students or for yourself but I will show you what and where I go to work with the iliacus. If you have a case of the hip “pinch” let me know if this helped you. You’ll have to be firm with your pressure and probably consistent in getting on it. I have enjoyed these posts very much. Your description of the problem your student in Warsaw had reminded me of the miraculous results I obtained when you taught anatomy in Rome,Ga. to my training class at Springstone Yoga. When you suggested to us the scalines in the front of our necks could have an effect on our shoulder flexibility, I immediately began targeting those scalines that were tender. After just 10 minutes or so of massage, I was able to position my arms in Gomukhasana with my right arm on the low side for the first time in 6-12 months. I am happy to say I am even more flexible today. You have a gift and we are all benefiting from your willingness to share that gift. Thanks for saying so Sandra. This post has helped me tremendously! I have been dealing with this same “pinching” sensation for years. I first noticed the pain when I was training in Chinese Martial Arts. We would do a lot of drop stances which are something a lot like Skandasana pose. The pain disappeared once I stopped training in martial arts only to return again once I started yoga, particular in the exact poses you mention in your post above. I was off and on with yoga so I really did not take it too seriously until recently. I have gotten back into yoga full force, preparing for an upcoming yoga teacher training and the same pain has returned. I couldn’t find anything describing the cause of my exact situation until I ran across your article. My boyfriend, knowledgeable about anatomy, helped me locate the iliopsoas and massaged it according to your advice in the video. It was painful, but I tried to just keep relaxing into the massage and breath. I then attempted the exact exercises that only moments before were giving me so much discomfort, and too my amazement, the pain was significantly decreased to the point where I really did not feel it! I have continued to massage the iliopsoas and now I can say I am almost pain free during my yoga practices! I appreciate your advice, it has made me one happy yogi! I’m so glad you found the article and it fit what was going on for you! Even better… it helped! Thanks for all the great info on your site, and on your DVD. Invaluable stuff. Hi David…I’ve experienced what I think is this same pinching/cramping you describe in this post intermittently in Paschimotanasana as well when the quads are engaged…strange and startling feeling, causing me to back out and attempt to reset the posture over and over…one side only…quite a cramp up in the pelvis…will try your suggestions, thanks! I’m having the same symptoms – not with twisting poses but forward bends like Uttanasana and Paschimotanasana. When I relax my quads it goes away. Perhaps I shouldn’t engage quads in these poses? It’s not a severe pinch but I also realize that my hip flexors on the affected side are weaker than on the other. You’d have to double check and see if you’re also engaging your psoas along with your quads, most people do. You want to be sure if it is the quad that is causing the sensation or the psoas. it could even be a muscle we’re not discussing here such as Tensor Fasciae Latae. Be careful with the idea of weakness, not all weakness needs to be strengthened, it can also be from tension and dysfunction! Try to figure out which muscle it is specifically. Use the video to palpate your iliacus, but do it while in a forward bend. I’ve been working very consciously for the past few months on bending from my hips. For some reason, that focus has led to me getting this “pinch” in forward bends–Uttanasana and Prasarita Padottanasana are the worst. Last night in class it even happened in down dog. It’s also been a bit cold in the studio lately. Tried your massage technique, today. It works to relieve the problem in the short run and actually helps me to feel a better extension through my spine. If only there was a similar technique for hamstrings! If you find short term relief from treating your own iliacus/psoas then you want to stretch them long term… and perhaps have them treated by a professional. Any movement that takes your hips into extension and beyond is helpful. My personal favorite is lunges on one knee and reclined hero’s pose then actively trying to lift your hips up. Don’t over do it though. It can cause the muscles to tighten up even more. You’re asking a good question. 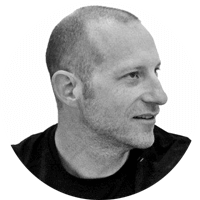 The practice builds the sensitivity and relationship to parts over a long period of time. Even then, we can fool ourselves and create stories in our mind. Keep practicing and keep studying. Use a qualified resource outside of yourself to confirm/deny what you think is going on and how you’re doing it. it’s a process and a learning. No shortcuts or recipes that work or fix it all. while doing twist,,,,of course i never had knees to the chest so far. ilio psoas for sure. still wondering with the discomfort in my sacrum. because even bringing knees to chest creating discomfort in sacrum. by the way the way you are descrbing function of muscles are amazing. Hi David! It’s been a while… i love this explanation and will def try the technique. I too have run into the hip pinch a lot,both personally and with students. There is something i have been doing that always, like every single time,works. Let me know if this is sound and fits what you know. Student entering posture,let’s say parvrita parsvakonasana with back knee down, i ask them to root into base of big toe, do an internal rotation at hip,then keeping root and rotation,find abduction to natural position. I never identified the muscle but after reading the above article, It seems that these actions would release the illiacus,right? Hi Angelique! It has been a while… It’s definitely worth a try. Your system of ultimately asking them to abduct the hip sounds good and does work sometimes as well. Also keep in mind, the latest craze in yoga injuries (I’m half kidding) labral tears. They can also create a pinching sensation in the hip joint. In those cases however, it is usually not limited to the adduction we find in a posture such as this. But adduction is often a problem. New article coming out on that subject shortly. I hate to throw that into the mix… but either way, if you rub iliacus and the pain goes away, it’s not labral. If you abduct and then the pain is gone, it’s not labral… if you try all of it and the pain persists… it COULD be labral. I had a similar challenge to your friend in Poland, and it turned out to be a hip labral tear. You might be interested to see more about that, and whether it might be the cause of his pain. It wasn’t for my friend in Poland… but read the comment and reply above yours. Pinching in a twist COULD also be a Labral pinch or tear. It could also be FAI… all of this is coming in my next article. If I get a moment to sit down and finish it! Thanks, David. Same thing with my right hip in Marichyasana C. I tried massaging the strings where the femur comes to the hip (didn’t know what else to do) and somehow I managed to do it. The pain comes when pushing my right knee to the left, in order to catch it with my left arm/armpit. Very unpleasant pain. I’ll try your solution next time I practice.